Private, Detached, Holiday accommodation for two. 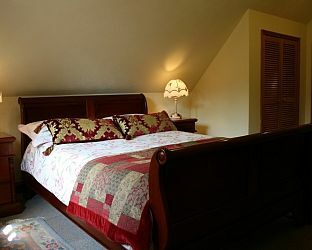 Stay in our Cottage Style Bed & Breakfast Apartment with it's own private deck overlooking the 1.5 acre woodland garden. Situated on the edge of the village of Yeoford, with it's Pub and Railway Station (Tarka Line) within half a mile. 12 miles from the Cathederal City of Exeter and 4 miles from Dartmoor National Park. Mid Devon location. Visit North Tawton Devon and the surrounding villages and stay in b and b, hotel or vacation rental accommodation provided by BedPosts members. North Tawton, Devon, once had a Roman fort and was recorded in the Domesday book in 1086. The tower of St Peter's Church dates back to 1257. People of the town are now employed in light industry and the woollen trade has ceased. If you seek accommodation near North Tawton in Devon you have come to the website of a “club” of providers who offer affordable quality accommodation around UK in hotels, bed and breakfasts, guesthouses, inns, and restaurants plus self-catering cottages and apartments .